Fuel Capacity 20 Litres/ 5.3 US gal. Behind every good man there’s a strong woman. Or vice versa? 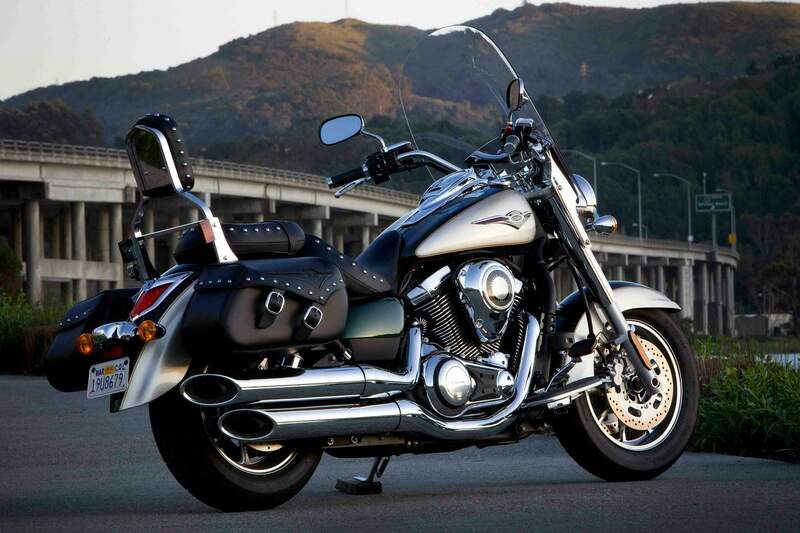 Let’s just say the Vulcan® 1700 Classic is built with two-up cruising in mind, with just the right mix of features – a large windscreen, leather saddlebags and a passenger backrest – to make any road trip an offer your significant other just won’t want to refuse, no matter who’s in control. A pair of top-grain, reinforced cowhide saddlebags are at the core of the Classic LT’s touring package, with leather carefully selected to minimize flaws and deep-dyed to help protect its finish from minor scrapes. These ideally-sized bags feature a slant-top opening held shut by two 1.5-inch wide leather straps, fitted with chrome buckles and concealed quick-release fasteners. Rolled and riveted lid tops along with metal reinforced upper edges maintain the bags’ shape and help keep unwanted moisture away from your cargo. Comfortable rider and passenger seats are a must on a cruiser able to tackle anything from daily commuting to day trips with a partner, and the Classic LT’s got them, along with a classic-style backrest to keep the passenger relaxed and smiling as the miles tick by. Detailed with chrome plated brass studs to match the bags, the classically styled seat and backrest blend attractive visual appeal with practical comfort. A large, optically correct, acrylic windshield rounds out the additional 1700 Classic LT features. It offers adjustable height and delivers serious wind protection for the rider and passenger. The Classic LT V-twin uses a single overhead cam in each cylinder head, rather than a push-rod overhead-valve arrangement, to boost efficiency and provide quick acceleration and superior passing performance. The engine’s long-stroke design, high compression and big displacement produce massive amounts of quick-revving horsepower, all of it delivered with a distinct V-twin character. 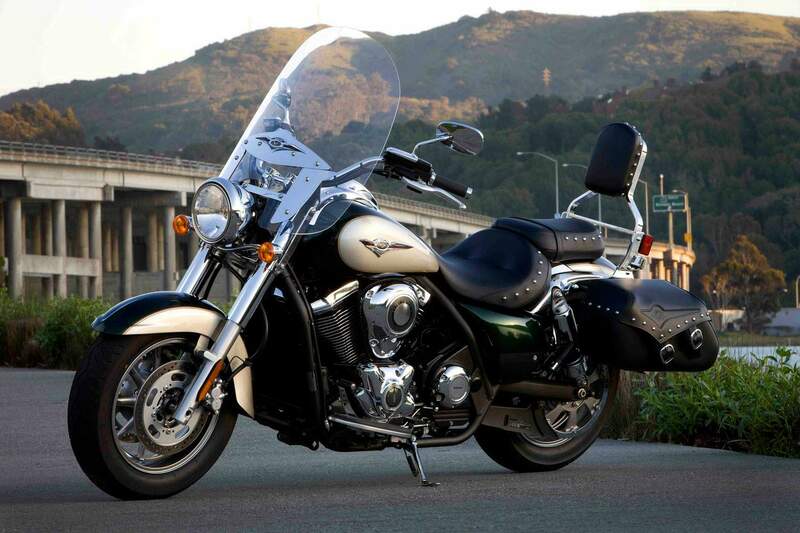 A fully electronic throttle valve system feeds that big V-twin exactly what it needs. Working with a powerful ECU and the rest of the fuel injection system, the electronic throttle valve enhances response without detracting from its distinctive V-twin feel—delivering ultra-precise intake flow to the engine under nearly any conditions. The system utilizes an Accelerator Position Sensor (APS) and a Throttle Position Sensor (TPS). Both units feed data to the ECU, which adjusts the throttle plates to tailor intake airflow accordingly. The system offers a natural throttle feel, because the APS is activated by a throttle body pulley that’s connected by cables to the throttle grip. Like the systems in use on the Ninja® 650R and Vulcan 900 motorcycles, the Classic LT’s fuel injection uses one sensor in place of the usual three, for less complexity and weight. Besides the obvious FI advantages like improved fuel economy and automatic adjustment for altitude changes, the system also permits easy hands-off warm-up and idle speed control. This cruising-oriented machine features FI and exhaust system tuning that has been optimized to deliver peak torque at a lower rpm – ideal for urban and back road environments. Mated to that rumbling V-twin engine, a six-speed transmission featuring overdriven fifth and sixth gears contributes to a relaxed ride and better fuel economy at highway speeds. The Classic LT transfers torque from the transmission to the rear wheel through a thin and light carbon fiber final drive belt that’s just 28mm wide. Thanks to its carbon fiber construction, the belt offers 40-percent higher tensile strength than a Kevlar unit of the same width. Designed to be as light and slim as possible, the Classic LT’s single backbone double cradle frame offers a short seat-to-steering head distance, with a correspondingly short wheelbase. Those easy-reach handlebars facilitate slow-speed maneuvering and help maximize rider confidence. Adding to the light and easy handling are suspension components that match the Vulcan 1700 Classic LT’s intended usage. An elegantly simple rear swingarm with twin air-assisted shocks provides 3.1 inches of rear suspension travel, and features air spring preload and four-way rebound adjustment. Up front, a large 43mm fork offers precise steering feedback and 5.5 inches of travel. The LT rolls on nine-spoke cast wheels, which use tubeless tires and complement its open-road character. A 130/90 front and a 170/70 rear are mounted on those attractive wheels. Dual 300mm front disc brakes with twin-piston calipers and a 300mm rear disc brake with a two-piston caliper help bring this stylish machine to sure, powerful stops. The Vulcan 1700 Classic LT also features a liquid-cooled alternator with rare-earth metals that produces a staggering 46.8 amps of electrical output, providing the 1700 Classic LT with more than enough current to power additional accessories. Technologically modern though it may be, the Vulcan 1700 Classic LT is still infused with all the charm and visual appeal that’s expected from a Kawasaki cruiser. 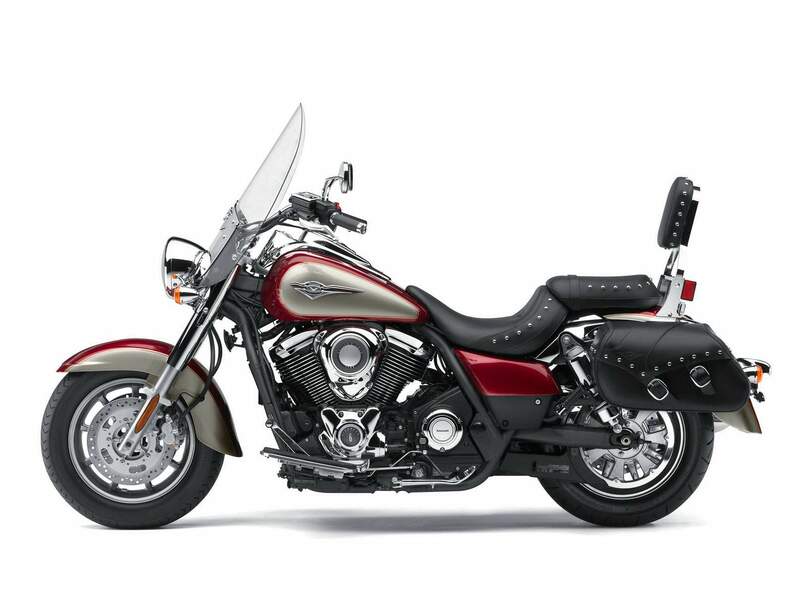 Careful attention to detail and exquisite craftsmanship of the engine covers, bodywork and those beautiful saddlebags add up to a motorcycle that turns heads whether it’s parked in your garage or cruising down the highway.